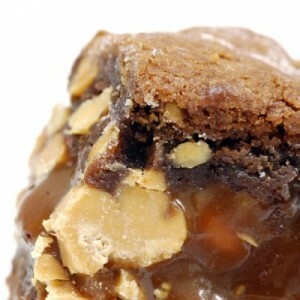 A Delicious recipe for chewy caramel brownies. These are a very special treat that guests always enjoy. Mix flour, cocoa, baking powder and salt in large bowl. Beat together sugar and butter in large bowl with electric mixer until smooth. Add eggs, one at a time, beating well after each addition. add vanilla extract. Add flour mixture and stir until well blended. Spread 3/4 of your batter evenly into prepared pan. Sprinkle evenly with caramel pieces and hazelnuts. Finish spreading the remaining batter over caramels. Bake for 25 to 30 minutes. Remove from oven and let cool before removing from pan.